She called the government's stance "discriminatory and patronizing." 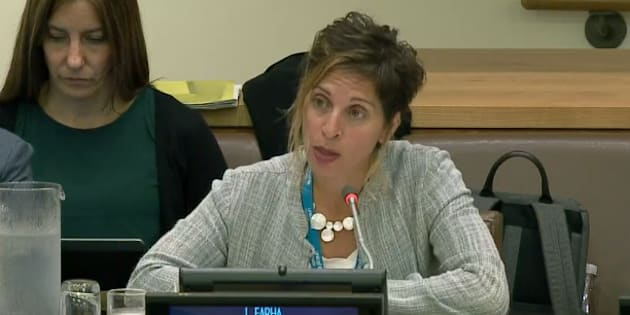 Leilani Farha, Special Rapporteur on adequate housing, speaks before a UN committee on Oct. 27, 2017. OTTAWA — A United Nations housing watchdog is taking the federal Liberals to task over what she sees as the government's about-face on a promise to put a human rights lens on its housing strategy. In a scathing letter, Leilani Farha, the UN special rapporteur on the right to housing, says her support for the strategy is waning, based on indications that the Liberals "may not recognize the right to housing'' in forthcoming legislation to enshrine the 10-year, $40-billion program into law. A Liberal point man on the housing file told the Commons last week that the government didn't want to declare a right that creates a belief that people can "prosecute their way into housing'' and that they need landlords, not lawyers. United Nations Special Rapporteur on the Right to Adequate Housing Leilani Farha attends a press conference in New Delhi on April 22, 2016. In an interview, Farha said Ottawa can't create a rights-based housing strategy without formally and legally enshrining housing as a human right. "At a time when human rights are so fragile around the world, with populist governments reacting against the multilateral human rights system, I would think the government of Canada — which stands apart — would do everything it could to embrace human rights,'' said Farha, who also heads the group Canada Without Poverty. Farha's letter is aimed at putting pressure on the government as it spends the summer working on a bill that would also create a federal watchdog to track progress and identify systemic issues in the housing system. "It's never been proposed as a charter amendment, or as a court to correct individual grievances,'' Adam Vaughan, Duclos' parliamentary secretary on housing, wrote on Twitter. The government's efforts won't do much to deal with barriers that get in the way of expanding the supply of affordable homes, said Conservative critic Karen Vecchio, who cited red tape as one such barrier that vexes builders at the municipal level. The NDP earlier this year unsuccessfully tried to have a right to housing added to Canada's Bill of Rights. The party's housing critic, Sheri Benson, said she wanted to see strong language on housing rights in the legislation the Liberals could table in the fall. "How are we going to hold a government to account for a 10 year strategy if you don't really have good legislation,'' Benson said.